Microstepping Stepper Motor Driver Kit. This page is for theory of operation only. For operation instructions see the Users Guide and for instructions to build it, see the Assembly Manual. Cheap microstepping drivers seemed to be nonexistant. with cheap non-specialist parts (no stepper ICs). and 4-WIRE MOTORS WILL NOT WORK WITH THIS BOARD. resistor values i've tested. It actually works quite well! is 3600 steps/rev, almost stepless operation. more available torque and quieter more powerful operation. formats for different user requirements. and this is provided by 4 PIC outputs and some resistor ladders. in software. My software (supplied) does 200,400,1200,3600 steps. C5 and C6 are the ramping capacitors. the bipolar wiring and can perform better at higher speeds. for microstepping. It also allows good high speed motor operation. of motor voltage or power supply voltage. ohms etc, and the board will run them at the same (set) current. mode. Additional software control by the PIC gives 3600 steps! Good for science/robot motors to move in 0.1 degree increments. tiny stepper chips like the UCN5804. Yes this driver does get hot, and needs a heatsink! current into something inductive like a speaker or motor. giving a "ramp" from one current step to the next. Ramping rate between steps is selectable by the capacitor size. the "two steps forward one step back" effect of hard ringing steps. motor speeds like 0.5 rps can be made smooth! No other cheap stepper driver does this! 3 current levels, 1200 steps, with linear ramping! 9 current levels, 3600 steps, with linear ramping! That is a "sine-like" wave for almost stepless operation. Also: A Java simulation of this circuit. perfect ramping, but for a cheap simple solution it works ok.
so when the step occurs the volts ramp smoothly to the next level. proportionately increase the current past the zero point. give the currents above, give or take a few percent. 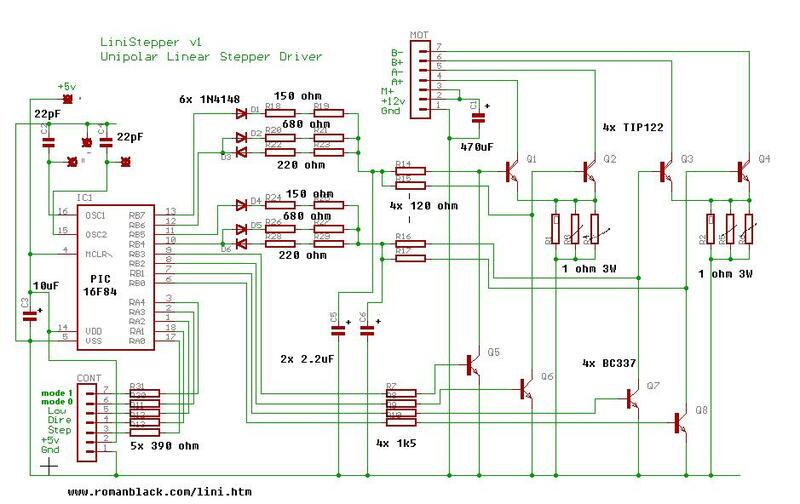 The hardware microstepping alone gives 1200 step operation. giving "tween" current levels of any amount. I would like to use linisteppers to drive Vexta pk246 motors with encoders. They are 3 amp/phase in unipolar mode. When ordering the kits - 4 axis - can you provide the parts that are needed for 3amp/phase operation as part of the kit ? The description of use for higher amps sounds hesitant; do you advise against it ? Is there a detailed post from someone that runs a 3 amp/phase motor with this card ? James Newton of James Newton's Massmind replies: Sorry, I can not change the component values in the kit. But the power resistors you will need are commonly available at any electronics supplier. At 3 amps, in microstepping modes, the power transistors on the Linistepper will get very hot. It is your responsibility to keep them cooled down enough that they don't burn out. In full or half step, heat will be much less of a problem. If I have a look to the schematic image http://www.piclist.com/images/member/RB-ezy-Q33/circuit.gif i see R14-R15-R16-R17 in series with the base of the four TIP122... Is it the right way to connect these components? In the costant current explanation it seem that the resistors should be connected to GND... Is something wrong in my idea or it's only a second "version" of the current controller circuit? can you explain how the sense resistors work, from the circuit it would appear the are current limiting only, how is the pic able to sense the apms/volts? also see possable use as 3 phase inverter driver?? I really like your way of thinking on stepper motor control. I started out getting involved in model railroading, but my eyes have gotten so poor at age 66 that I decided to convert my small Myford lathe into a mill so I could drill holes more accurately. Then I started thinking about adapting CNC to it. This would allow me to program for repeat hole patterns etc. Very nice! I have a question about the tuning of the linearity of the C-R2 circuit for different stepping speeds. If I put a digital pot between the C and the Base junction with R2, will that vary the charge time and let me tune on the fly? R(digital pot) would vary with step time and inverse with step size (longer time between steps == lower R, smaller steps == higher R). Looks like what I need, but first -- a bit of guidance. I want to drive and control, remotely, three needle valves. The inputs would be three potentiometers, giving some kind of voltage input to your control boards. Each board would control a stepper motor, geared or otherwise connected to a needle valve shaft. Turning the potentiometers from zero to max. would then turn the needle valves from fully closed to fully open. This is obviously a low-power application, but will require fast response and frequent changes, up and down. The system will be in continuous duty, over a period of hours. I don't see any need for mode changes; we would presumably set it permanently in microstepping mode. 1. Is this feasible, as it appears to be? 2. What would be the appropriate voltage to apply across the input potentiometer, and exactly how would that be applied to the control board inputs? 3. Recognizing that a needle valve requires several revolutions from fully closed to fully opened, how would the input voltage range be converted into several stepper revolutions? Would it be necessary to use gears, or can zero-to-max input produce, say, four full stepper revolutions? 4. Am I on the wrong track here? Is there a simpler and cheaper way to accomplish what I am trying to do? Thanks for your advice. BTW, your presentation here seems outstanding, remarkably complete, and very clear. The apparent quality of your kit, and the user guidance, are excellent. The linistepper (as is) does not respond to an analog signal but rather to step and direction digital inputs. You would have to either A) Change the programming of the on board PIC microcontroller to use an A/D converter and read the signal then generate step and direction commands for the existing stepper controler code, which you CAN do because Roman has made this an open source project, or B) build some other controler that translates the analog voltages into step and direction commands. A PIC or SX would be fine for doing that. Probably even a basic stamp. See the answer to #2. But there is no limit on the rotation of the steppers. It depends on what you really need. I think you are looking for a servo based system rather than steppers, because some servos can adjust position based on an analog input and it is easy to convert an analog input into the pulse width signal that standard servos accept, but the cost of a servo that is strong enough will probably be higher than the cost of a stepper and controller. Servos include feedback (which is not usually necessary with a stepper), electronics and gearing which increase the cost. Also, I haven't seen a servo that would do more than about 180' (they may exist, I just haven't seen one) so that requires gearing as you suspect. Finally, you may find that a simple 1:1 relationship between the analog input and the valve position is not what you actually need. In that case, haveing a microcontroller in there would allow you to vary the valve position as you wish. Thanks for the kind words and good luck with your project.